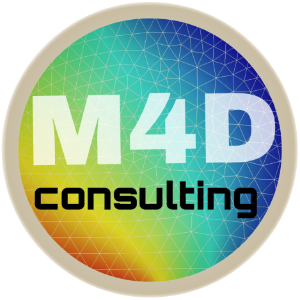 Based in Toronto, M4Dynamics™ is a software development and consulting company. We specialize in simulation analyses pertaining to solution thermodynamics and multiphysics, the design of customized COMSOL® applications and models, and COMSOL Multiphysics® training. Utilizing our extensive experience in process simulation, we work closely with our clients to deliver high-quality and highly specialized simulation solutions – all while ensuring fast turn-around times. T. Marin-Alvarado, "Combining Multiphysics Modeling and Solution Thermodynamics Using M4Dlib, an External Library", COMSOL Conference 2015 Boston. T. Marin, “Solidification of a liquid metal droplet impinging on a cold surface”, COMSOL Users Conference 2006, Boston, USA, Ed. Jeri’Ann Hiller, pp. 391-398, 2006. T. Marin and T. Utigard, “Surface Tension Driven Flow During Oxygen Top Blowing of Liquid Copper”, Proceedings of the COMSOL Multiphysics International Conference 2005, Ed. Jeri’Ann Hiller, Cambridge, Massachusetts, USA, pp. 165-170, 2005. T. Utigard, T. Marin, A. Warczok, R.A. Bergman, M. Barati, C. Diaz, “Energy Recovery from High Temperature Steel, Copper and Nickel Smelter Slags”, in Conference of Metallurgists 2011, Montreal, QC, 2011. T. Marin, “Numerical Modelling of Free Surface Flow Problems with Phase Change- Three Phase Flows”, Chapter 9 in Multiphysics Modelling with Finite Element Methods, World Scientific, London, 2006, pp. 297-308. T. Marin, T. Utigard, “The Kinetics and Mechanism of Molten Copper Oxidation by Top Blowing of Oxygen”, Journal of Metals, vol. 57, no. 7, pp. 58-62, July 2005.